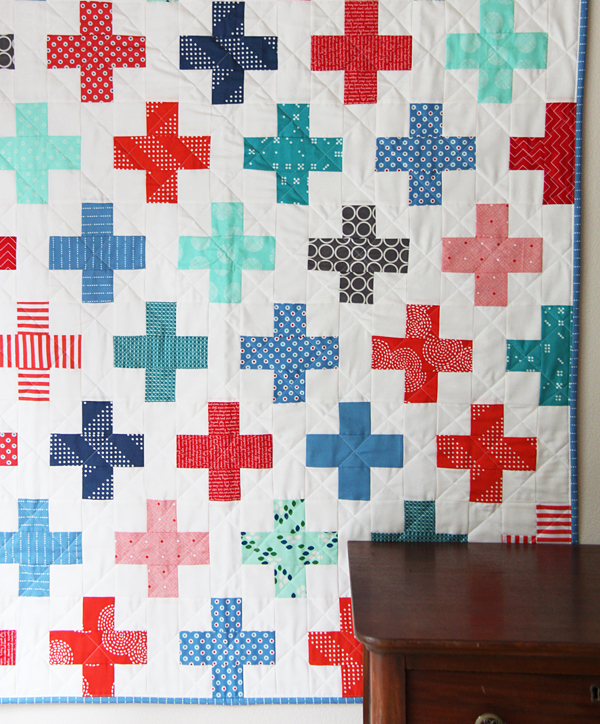 I will never tire of a simple plus quilt! I made this for a friends baby boy, it’s one of my go-to baby quilts because I always know the Mom will like it. I stuck with blues and reds this time. Two color quilts are my favorite kind, and using lots of different hues of the same colors keep them from looking blah. Sometimes, if not all the time…less is more! This quilt is fairly easy but if you need a pattern with the math figured out for you in 6 sizes, there is a PDF pattern available here. I did a simple cross hatch straight line quilting using the corners of the pieced blocks as a guide. I eyeball my lines straight as I go, and since there are so many corners of the blocks and units it’s pretty easy to stay semi-straight with this pattern. I did an experiment with this one and quilted this without a walking foot on my Juki. The walking foot is the only part of the Juki I dislike so far. As I’ve said before it’s extremely loud and clanky, and honestly I wasn’t sure if it made that much of a difference. 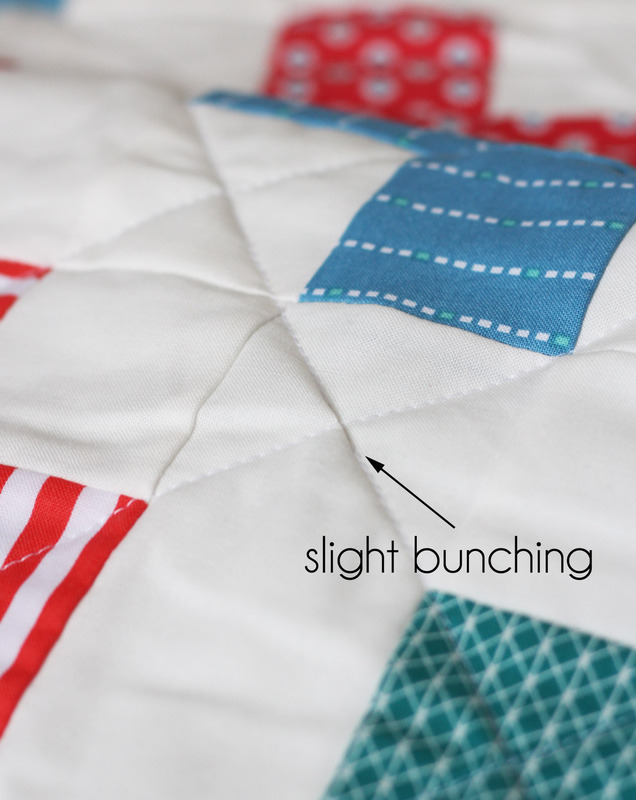 So I tried to quilt and bind this whole crib quilt without it…and I was pretty impressed! Now I have to admit that my basting was bad to begin with…crawling around on the ground pinning and being pregnant don’t mix. There were a few areas where the fabric bunched a bit, but that was probably due to my bad basting. Overall I was really pleased with how the Juki does without a walking foot! It did great on the binding too, no pulling or bunching even with all those layers like my Bernina does. Monday morning we found out our 4th (and last!) baby is a girl, and that afternoon my husband brought in 5 tubs of our saved boy clothes for me to go through and give away. Someone was a little bit eager to get his garage space back! 2015 a little late and baby! What a wonderful quilt for your friend ! Love the colors! and the design and it speaks highly of you crawling around very pregnant to make a gift for someone else! As for all those lovely baby clothes, how about a type of memory quilt made out of them? Congratulations on expecting another sweet little girl! Take care. Thanks Melissa!! Hope your doing well!! I love this quilt. You did a great job quilting. Could the walking foot for your Juki be defective? Sometimes a noise is a sign that something isn’t right. Time flies, and I know it is early to think of grandbabies, but the thought of taking pictures of father and son in matching outfits is a good reason to hang on to your favorites. I thought it was defective…this is my second Juki and the first actually was defective. This one is really loud but I even took a video and showed it to the tech…he agreed it really is just that loud and clanky! Luckily it doesn’t need it most of the time! I love a simple plus quilt like this. Lovely. It’s always tear-central whenever I go through baby clothes around here. I’ve heard it’s better when you give them away promptly instead of holding onto them for years. I’ve never accomplished that though. Good luck! Love your colour palette on this one. I spy so many of my favourite prints. I also like how the rows of pluses are offset. Gives the eye somewhere to move! As for saying goodbye to all those boy things, just think of the happiness that others will have from those clothes (and about the cute girlie things out there). Besides #4 can wear some of those things… my Girl Twin gets handmedowns from her much larger Boy Twin! Love the Plus quilt in those colors. It is always sad to see the end of an era, but congratulations on your little girl. Life will be completely different in pink! We had 4 boys and then a girl. I like this. It may only be blue and red, but it is definitely not plain or boring. Good luck with the new baby girl. The simplicity of the quilt pattern and colors is so refreshing. I’m glad you saved some of your favorite clothes. I have some 6-month overalls my boys wore and a newborn dress my girl wore hanging in the hallway with their baby pictures. The oldest is now 20, so the clothes seem very small. You know what? I bet anything you will be so glad someday you saved some of those baby boy clothes! When you have grandkids, they will be fun to bring out. I MADE MY KIDS QUILTS OUT OF THEIR BABY CLOTHES. ITS ONE OF THE BEST KEEPSAKES AND IT GETS USED DAILY. THEY LOVE TO HEAR ABOUT HOW CUTE THEY WERE IN THIS OUTFIT AS WE POINT OUT DIFFERENT SQUARES. I DON’T REGRET CUTTING UP THE CLOTHES AT ALL. I SAVED EVERY RUFFLE, POCKET, AND CUTE TAG I COULD TO PUT IN MY DAUGHTERS QUILT. ITS HER FAVORITE SNUGGLE BLANKET. I saved some of my kids baby clothes and gave them to them when they had my grands. It was wonderful seeing those clothes used again. They were the cutest ones. 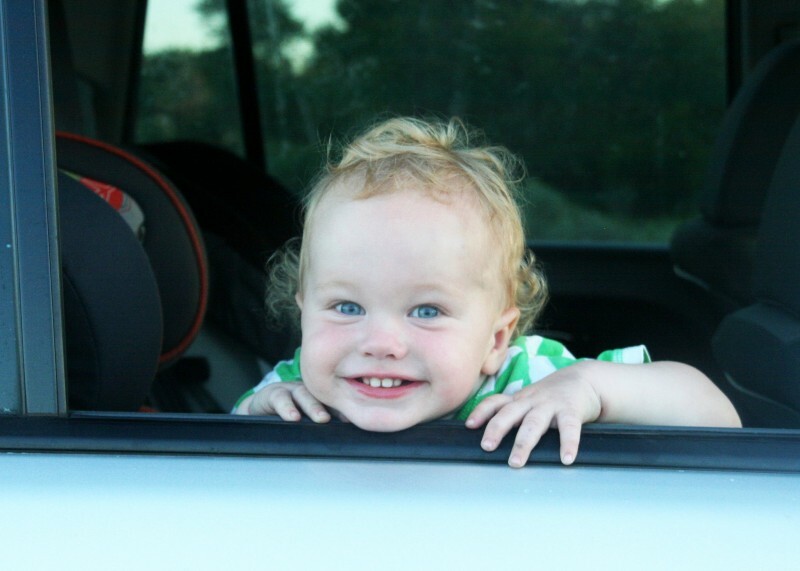 Your little girl will be happy to have a sister (cute pic of her). A new baby is always exciting! Yes, keep some of those clothes in a special hiding place – we won’t tell him! Love the simple color palette and quilting, it fits this quilt perfectly. I like how the plus signs are offset too! Congrats on your upcoming baby! I love this quilt. Is the pattern posted anywhere. Would love to make one. What a cute quilt! I love simplicity! And a simple cross-hatch quilting design always works. Oh oh. I just got my Juki back from the repair shop. (I put the bobbn in crooked ). I was going to try quilting without the walking foot as i hate the noise it makes! Is this your Inside out pattern? No this is a different one Nancy using strips, just cut 2 1/2″ squares, and 2 1/2″ x 6 1/2″ strips…very easy! 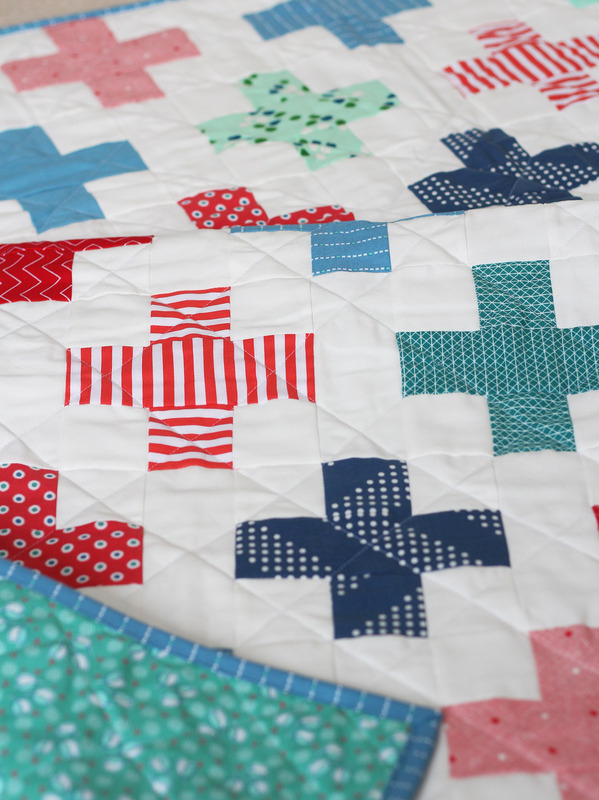 Love the cross quilt. I found some little singlets the other day that I had embroidered with little rabbits. My baby is now 20 and 6 foot 8 and 3 quarters. I gently folded them up and put them back where I had found them. Love the quilt! Yes, simple/classic/timeless is often best. Don’t throw all the baby clothes out! A friend was a department store buyer and used to stock 60% baby boy clothes. Girls can dress like boys and still be socially acceptable – just stick a floral headband on her to avoid confusing old ladies who stop to admire the baby. Don’t worry I didn’t throw them out!! They were in such great shape I gifted them to my cousin having her first boy next month. :) I already have enough girl clothes from my older daughter to keep the new baby clothed forever lol! I saved some baby clothes for 35 years (!) and now my Granddaughter is wearing them. Fortunately my daughter loved them too and they don’t look old fashioned. I did offer them to my DIL a few years ago but she didn’t want them at all! 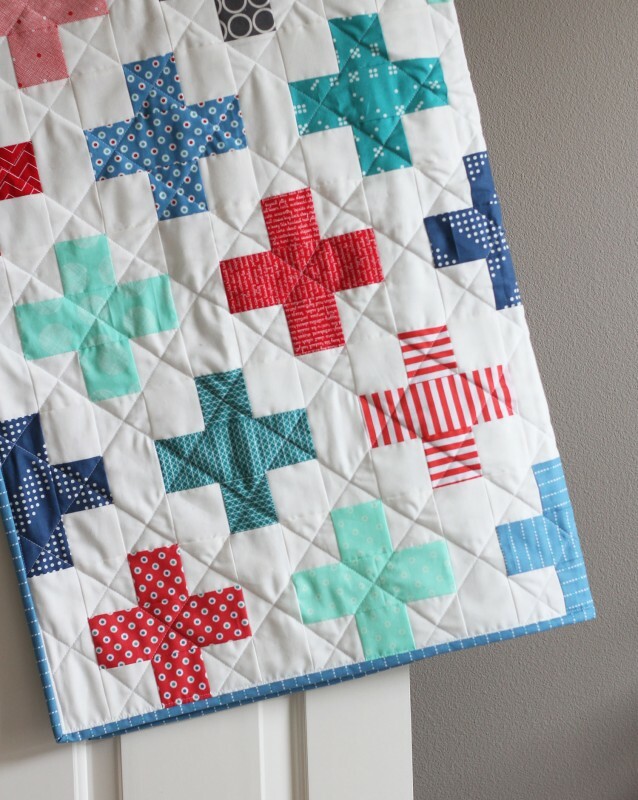 Love this quilt and the quilting compliments it so perfectly Allison! Maybe you could save out some of the boys’ clothes that are destined for the giveaway and use them to make a scrappy quilt for your new little baby girl. I love the fabrics and colors you used in this quilt. I never tire of plus quilts. Still have to make one myself. This is lovely. I adore how you pieced that diagonal stripe prints to get a zig zag effect. I agree it is hard to part with those little clothes. I just moved and found a giant tub of baby clothes. My last was 23 in July. I think it might be safe to give them away…..but it will make me a little sad. I will think of babies who have NEED and do that soon! Beautiful Plus quilt and congratulations on your coming baby!! Is this your Simple Addition Quilt? If so, what size are the blocks? Thanks, just wanted to ask before purchasing your pattern. a bit 22 months, then 4 yr 4 months apart). And now we have 2 grandsons and 2 granddaughters. Love every little bit of each and every one of them. Enjoy! It goes by wayyyy to fast! The quilt is lovely. Whomever you made it for is going to love it! 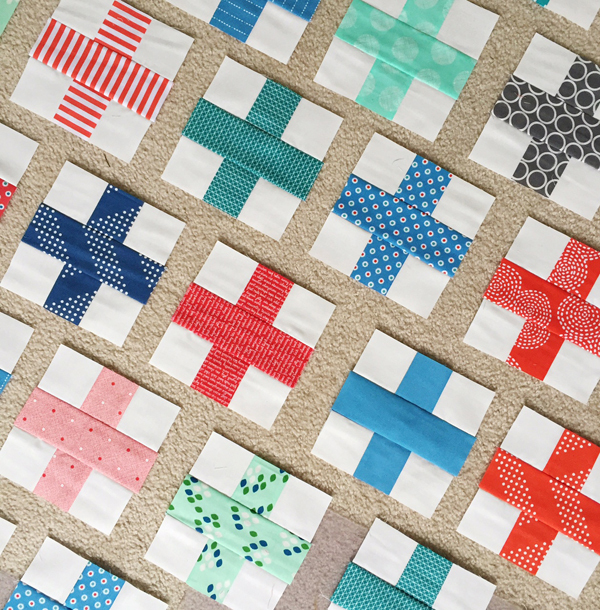 Time to turn those baby clothes into a quilt so that you can keep them! That’s what I am doing with my daughter’s clothes now that we learned our next one is a boy!